It’s always a serious matter of concern for most of the people, who cares for their privacy and hence wants to limit the access of other people to their Smartphones. As it’s not possible for most of the people to deny the sharing of their Smart Phones with others, they have to think about other alternations to secure the phone access. Actually, that’s not a big deal, there are many applications available to fulfil these needs. Out of the many, AppLock is the best and top rated application with great security and features. Using the AppLock, the user can restrict the access for other people, to almost any application or process. In simple words, the AppLock can assign a password to any application or process for their secure access. If you wish to protect AppLock Icon from the intruders, this how-to guide is for you. Please read it to the end, you will surely find this helpful. Important: This how-to guide is helpful for AppLoc installed on any mobile platforms including Android, Apple iOS and Window OS. How to Hide / Unhide AppLock Icon from Home Screen & Application Drawer. Although, the AppLock comes with full proof security, still there is a small loophole to bypass the restrictions. If anybody is able to uninstall the AppLock application using the phone’s settings or Google Play Store app, all the security restrictions will get abandoned automatically. Here, no AppLock in the smart phone means no security restriction for any application. 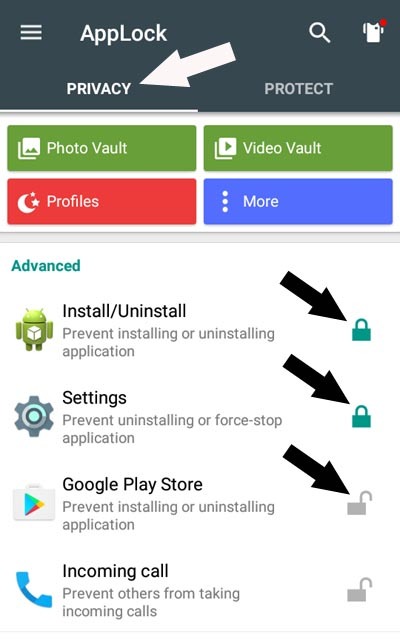 In order to fill that loophole to protect AppLock, Do activate the “Install/Uninstall” and “Google Play Store” option under the Advanced settings of the AppLock app. Inspite of all these security options, there is always a door in the floor for the advanced users to break any type of security. Luckily, the number of advanced users is very low and you always have the option to deny sharing of your Smart Phone with them. While sharing the SmartPhone with normal users, you only have to concentrate on few methods which will prevent unauthorized un-installation / removal of the AppLock app. How to protect AppLock app from unauthorized un-installation or removal. Open AppLock, lock the “Install/Uninstall” option. Within AppLock’s main screen, below Install/Uninstall option, lock the “SETTINGS” option. On same AppLock window, below SETTINGS option, lock “Google Play Store” option. Important: Locking Google Play Store app will add extra layer of security for unauthorized uninstallation of the applications. Performing all the above actions will even block the widely used evergreen method of uninstalling application by long-pressing its icon from the application drawer. The AppLock app has its own security layer, in this guide we will only discuss about preventing unauthorized uninstallation or removal of the AppLock security app. By the end of this how-to guide, you will be able to hide / unhide the AppLock icon from the home screen as well as the application drawer. In addition, we will guide you about protecting AppLock from unauthorized uninstallation by the intruders. You always have to remember that NO AppLock in the Smart Phone simply means NO Security restrictions. Below are the easy steps about hiding the AppLock icon from the home screen as well as from the Application drawer. How to HIDE AppLock Icon from the Home Screen & App Drawer Screen. Important: Prior to Hide AppLock icon from the home screen, Please check & update your AppLock app to the latest version as the latest version of the AppLock is more secure with many new security features. You can also make this a habit to regularly checking and installing the security updates of all the application, remember security & privacy matters a lot now a days. Below are the steps to hide AppLock icon from the home & app drawer screen. 1)- launch the AppLock app and provide the credentials if needed. 2)- By default, it will open PRIVACY tab, Just switch to the PROTECT tab. 3)- Under the PROTECT tab, expand the Magic menu and click / tap to the “Hide AppLock” option. 4)- Now, read the “how-to unhide AppLock icon” instructions carefully and activate the the “Hide AppLock” switch on Top. That’s it, You have successfully Removed / Hide the AppLock icon from the Home Screen and App Drawer. Just check the home and app drawer screen for the confirmation. We bet, you will find nothing there 🙂 . Actually, there is another way to hide application icons from the home and app drawer’s screen using some launchers like Nova Launcher. No worries, this is a complete different topic, which we will surely discuss at some other time. How to Open / Unhide AppLock Icon when already HIDEN using above steps. For any reason, If you wish to open the AppLock to protect more apps or to change any setting, there are two methods to open the hiden AppLock. Below are the complete explanation for these methods. 1)- Open Hidden AppLock using Phone’s Dialpad. Open the SmartPhone’s dialpad, type *#*#12345#*#* or #password in the dialpad. That’s it, the AppLock app is now open for you, perform any desired actions. Important: This action will never unhide AppLock icon from anywhere, this is just an alternative way to open AppLock. Please secure the AppLock with any secret password or pattern protection, the intruders may know this way to open AppLock too. Some Smart Phones may need to press the call button, to open AppLock with phone’s dialer. 2)- Open Hidden AppLock using Web Browser. This is actually the easiest way to open AppLock when its app icon is hidden. 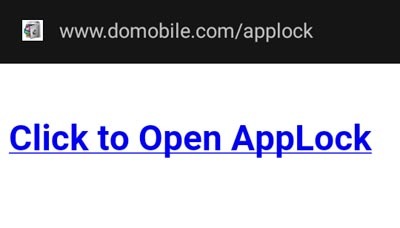 Just open any of the desired web browser in SmartPhone, type http://domobile.com/applock in the address bar of browser. Now, follow the on-screen instruction and you will be inside the AppLock. Important: Active Internet Connection is needed to perform this step to open hidden AppLock. How to Protect AppLock with any Password or Pattern. As discussed earlier, the intruders may know the above both ways to enter into the AppLock. SO there is an urgent need to protect AppLock with any password or pattern. Below are the how-to steps to assign password or pattern to the AppLock app. 1)- Open the AppLock app. 2)- By default it will open into the Privacy tab, switch to the Protect tab from top of the screen. 3)- Now, expand the Security menu under the Protect tab. 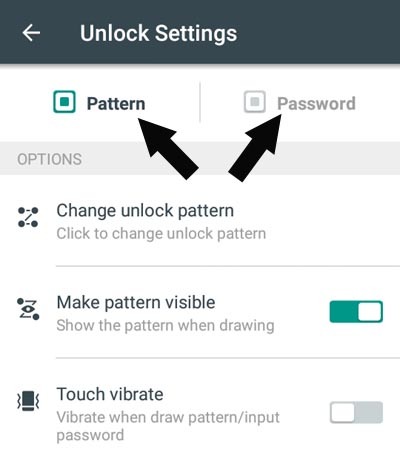 4)- Go to the Unlock Settings, choose Pattern or Password from the top tabs. 5)- Set any desired pattern or password to restrict unauthorized access of AppLock. Quick Recap about how to prevent unauthorized un-installation of AppLock. 1)- Lock Install/Uninstall using AppLock. Performing this action will restrict the access for Install/Uninstall process in the SmartPhone. Whenever this process is requested, it will need the applied password or pattern to execute. 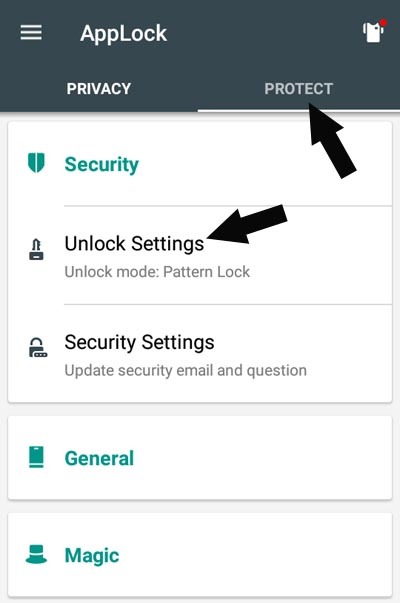 2)- Lock Settings using Applock. Performing this action will restrict the access to SmartPhone’s Settings menu. Not only the AppLock, securing the Settings menu with AppLock will secure many other actions too. 3)- Lock Google Play Store using AppLock. By performing this action, nobody will be able to install or uninstall the applications using the Google Play Store. Actually, this will block the source of the application, many advanced users uses this option to uninstall the applications too. 4)- Using Advanced Protection App. To add an extra layer of protection to the AppLock, you can also use Advanced Protection app. This app will prevent users to kill the AppLock without your knowledge. Advanced Protection App will need the administrative rights on your device. That’s all we have in our basket related to unauthorized removal or uninstallation of AppLock. Although, these actions are sufficient to restrict intruder’s access to the SmartPhone. If any loopholes left, please share them under the comments section below. We are very curious to add some more lines to this. In the end, very very thanks for your’s valuable time and visit. Keep visiting a2z infomatics, Have a Great Day.